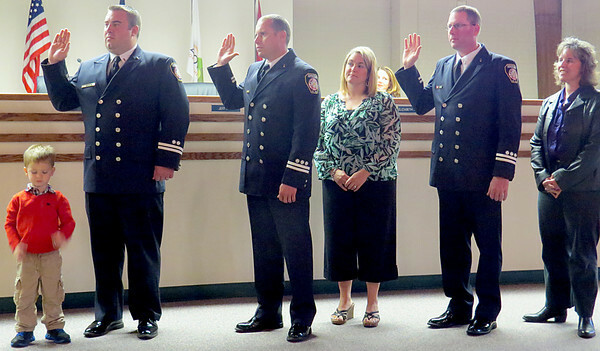 Zionsville firefighters Jason Potts, David Kail and Todd Scales are sworn in as captains during the Zionsville Town Council meeting Monday night, Oct. 7. The three captains were the top scoring applicants after participating in a promotion process consisting of written testing, oral interviews, pratical skills evaluations and physical agility. Pictured are Jason Potts and son Drew, David Kail and his wife Emily, and Todd Scales and his wife LeighAnn Akard.